Rotterdam has long been home to the widest variety of foreign religious denominations and churches. After the Reformation, the Netherlands was in vogue because of the freedom of religion enjoyed there. Rotterdam's Scottish and Walloon religious communities derive from those times. Many seafarers' churches would follow later. Often exotic structures, these have been welcomed by the city as an enrichment. This is not the case with the still contested construction of mosques for the growing Muslim community. Many exceptional churches are located on a route along Schiedamse Vest and Westzeedijk. This 'foreign church route' begins with the Scots Church on Schiedamse Vest. In the Park stands the Norsk Sjømannskirke. Its design is based on 13th-century Norwegian stave churches with a characteristic square plan. 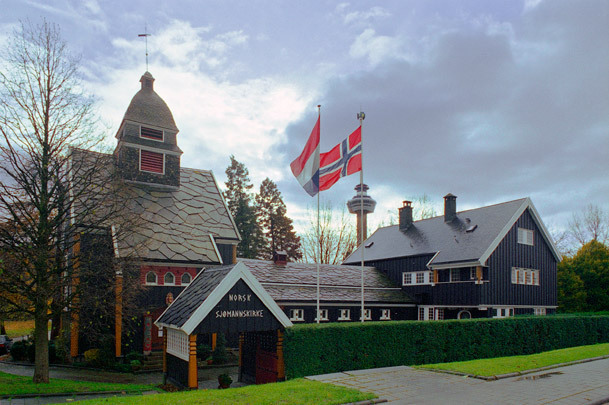 The timber church was brought to Rotterdam as a kit of parts and assembled on site by Norwegian carpenters. This came in handy when the church had to be moved in 1937 to construct the Maas Tunnel. It was dismantled and carried in three pieces to its new site 200 metres away. At Parklaan 5 you can still find the Swedish Seamen's Church in a converted private house; the Danish Seamen's Church is at Coolhaven 1. Farther along Westzeedijk the Russian Orthodox Church is situated. Near the Kunsthal is the Greek Orthodox Church.